We are located in Potomac, Maryland. Our salon is easily accessible via route 270. Our brides travel from DC, VA and even Baltimore because getting to us is a breeze! Yes! Plenty of parking is available right outside of our salon. Yes, our salon meets with brides by appointment only. Book your appointment well in advance, we are very lucky to be loved and our schedule fills up quickly. Appointments are 90 minutes so you will never feel hurried or rushed. Bridal gowns start at $1,500 and go up to $8,000. The majority of our selection is between $2,000-$4,000. Don’t stress about bringing shoes or a strapless bra to your appointment. However if you have a needed bra or your shoes already selected you can bring them with you. Weekday appointments are more flexible as the salon isn’t quite as busy. We kindly ask that you bring no more than 4 trusted guests with you on the weekend. How long does it take to order my wedding gown? This depends on the designer that you select. Most designers take about 5 months to make and deliver your gown to us. Rush options are available in most instances. Alteration require about 8 weeks, so ideally you should purchase your gown 10-12 months prior to your wedding date. We do our best to have a selection of samples in our salon in sizes 6-20. We are able to special order your gown in your size. Custom lengths are available in most designers as well. Pretty much everything! Visa, MasterCard, American Express, Discover, Check and Cash. Yes! We have seamstresses who will meet with you in our salon for fittings at an additional charge. Most brides require 3-5 fittings and we will assist you with scheduling these appointments. 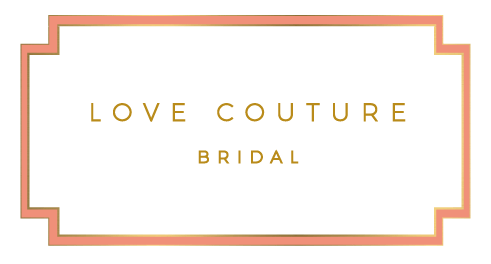 Our seamstresses only alter gowns that were purchased at Love Couture Bridal. Alteration fees will be negotiated between you and the seamstress; payment for alterations is made directly to the seamstresses as they are not affiliated with our salon. Trunk shows give brides the opportunity to view a larger selection of a particular bridal designer’s collection than what is normally present in our salon. In some cases a designer or a representative from the designer will be in the salon giving expert advice and assistance. A discount and or incentive is typically offered during trunk shows. Ideally you should purchase your accessories when you select your wedding gown. Our accessories are in most cases handmade and take time to make and arrive to our salon. Still have questions? We’d be delighted to help! Contact us here.